The Orange TH100 all-tube guitar amplifier head gives you two channels that let you range from glassy clean to aggressively crunchy. This flexible beast lets you choose between 100-, 70-, 50-, and 35-watt settings, so you can get the absolute most out of this amp on a loud stage, in the rehearsal room, or in the studio. Orange amps are known for their massive crunch and gain settings. Many of the hardest bands out there today rely on Orange for their bone-crushing wall of sound. Get that Orange sound in your rig with the Orange TH100 tube head! Dial in your tonesThe boys over at Orange have made it extremely simple to dial in killer tone. The TH100 head only has six knobs, and of those only three per channel are used. The clean channel gives you treble, bass, and volume controls to get everything from warm cleans to spanky brights. You’ll love the dirty channel’s shape control; it takes you from classic rock EQs to traditional Orange EQs to modern metal EQs – all with one knob. The volume and gain knobs round out the dirty channel, and did we mention that this amps has tons of gain? We know gain at Sweetwater, and this amp has enough for even the heaviest of metal-heads. Killer Orange looksThe Orange TH100 is immediately recognizable. Yes, the signature orange Tolex sticks out like a 7′ basketball player at a preschool, but the classic white face, which is an Orange signature, it looks like no other amp out there. Everyone will notice your rig and want to know what it is. The guys who do know will have serious gear envy. Orange is classy, what else can we say? Flexible power sectionThe TH100 head comes loaded with four ECC83 preamp tubes and four EL34 power tubes. The onboard effects loop is also tube powered (it uses a single ECC81 tube). The result? Big, beautiful, classic tones! When you want to keep the volume at lower levels but need to make those tubes cook, choose the low-wattage setting. It’s ideal for the studio or for quieter practice environments. Want to make some tube-flavored noise at a reasonable stage or studio volume level? Choose the 35-watt setting. You can drive the power tubes hard without driving the neighbors away. When it’s time to hit the stage, go for the 100-watt setting. 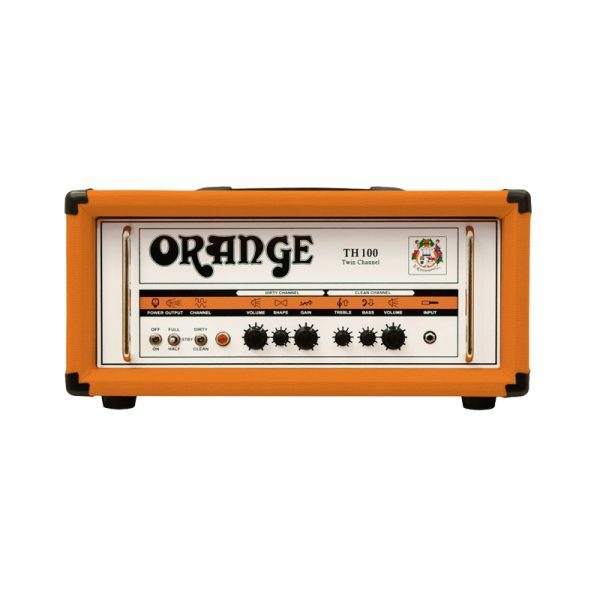 Orange’s TH100 head is an amazingly stage- and studio-friendly tube amp!